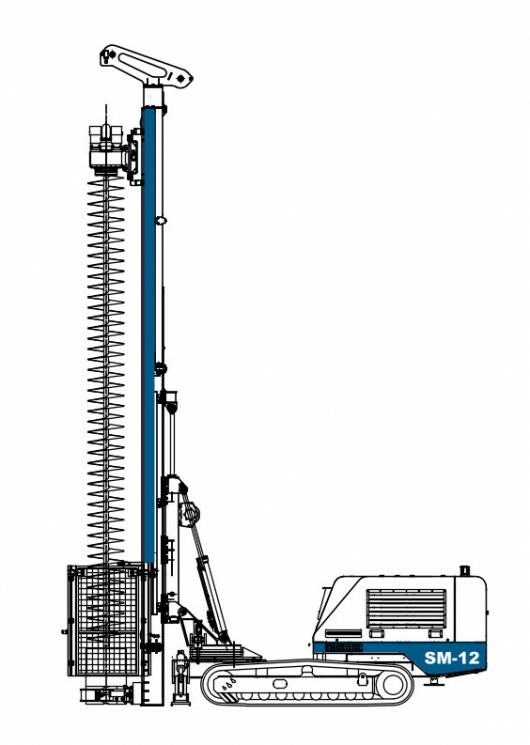 The Soilmec SM-12 is a restricted access drilling machine featuring two mast lengths with 6400mm and 1840mm mast stroke, both with a 140kN extraction force. The rig is suitable for up to 600 mm diameters auger drilling to a maximum of 6m length sections. The high torque rotary head has a 40kNm maximum torque with the ability for 4” concrete injection through the head due to the large swivel and swan neck. Fitted as standard with a double hinged safety guard and slow rotation kit complying to the new EN16228 European Standard. To view & download the PDF with technical diagram we ask you join our mailing list – you can unsubscribe at anytime.